That coming from someone who has single-handedly built a $19 billion empire with 19,972 stores around the world is a stunning display of humility. It’s also an acknowledgment of the challenges the company has faced when it entered other foreign markets. Starbucks took a decade-and-a-half to get it right in China, where it had to build a café culture from scratch. Being a late entrant into the Indian market—he’s up against competitors like Costa Coffee, Gloria Jeans Coffee and the homegrown Café Coffee Day—Schultz knows that Starbucks in India might not have the luxury of a second chance. The initial response has been stunning. There have been mile-long queues to enter the flagship store in tony Horniman Circle in south Mumbai. The 1,500-sq ft store at Oberoi Mall in Goregaon, the city’s western suburbs, is equally choc-a-bloc. The third store, at Taj Mahal Palace annexe, Colaba, also got off to a brisk start, but not quite on the same level as the other two. While Tata Starbucks officials declined to discuss sales data, retail experts say that the 4,000 sq ft two-storied store in Horniman Circle is generating an average sale of Rs 8.5 lakh a day. To put that in perspective, the best that any coffee chain outlet—like the 400-sq ft Café Coffee Day store in Mumbai’s domestic airport—does is a little more than Rs 1 lakh a day. No wonder Schultz is sounding a lot more self-assured. 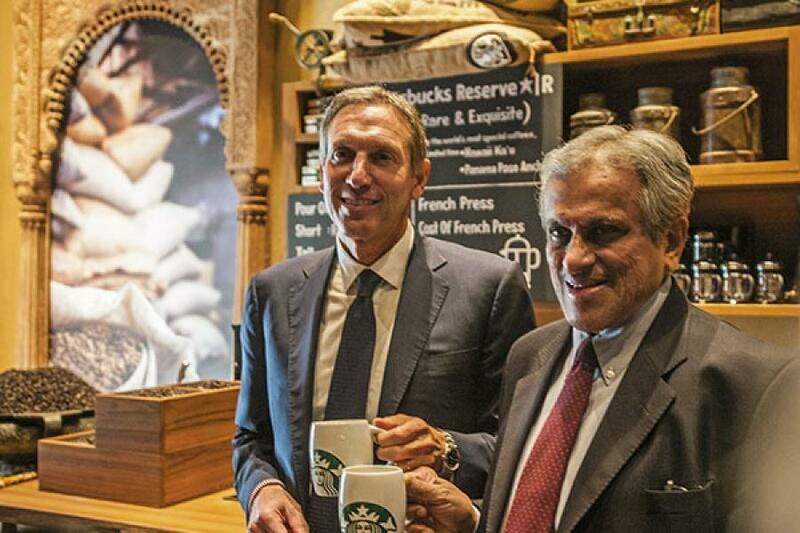 “I’m confident India will evolve into one of Starbucks’ five largest markets over time,” said Schultz on that same call. While its market entry may rank as one of the more successful global brand launches in India in recent times, the world’s largest coffee chain seems to be in no tearing hurry to ramp up operations. In fact, it plans to continue its slow, measured pace of growth. It is in no rush to play catch-up with local chains, particularly market leader Café Coffee Day, which has 1,350 stores across the country, with plans of expanding to 2,000 stores by 2013. Starbucks, says insiders, will stick to its script. There are at least two more new stores expected to come up in Mumbai, both in mid-town Mumbai, before the brand puts up its shingles in the capital with its first two stores, one at the Select City Walk in Saket and the other in Connaught Place early next year, and then move to Bangalore. By all indications, it is likely to have about 20 stores by the end of next year. That might seem a trifle conservative, especially since Starbucks took five years to prepare its entry strategy in India, with at least one aborted joint venture with Kishore Biyani’s Future Group. But then Schultz will know from his China experience that initial euphoria could be misleading. Other global brands like Levi’s, Nike, Ariel, Kellogg’s and McDonald’s have struggled to adapt to the Indian market. In his exclusive conversation with Forbes India in Mumbai, Schultz made it clear that he had been involved at every stage of the India launch, including examining the design for the flagship store that would be mailed to him every other fortnight. So what does Schultz have up his sleeve in India? Let’s rewind to January 2011. Schultz and his trusted lieutenant John Culver, who leads the chain’s Asian operations, had travelled to India with the aim to enter the market. This was the second time the company had attempted to enter India. It was done in classic Schultz style, where he travelled around the market to understand it. He arrived in Delhi and once his meetings with the government (being a single brand entity, the company could have come in without a partner) were done, he winged his way to Tata Coffee’s plantations in Coorg, Karnataka. Topmost on his mind was to source coffee in a manner consistent with the company’s policy of giving back to the community. In Coorg, Schultz spent time at Swastha, a Tata Coffee project for differently abled children. Those familiar with the negotiations say it played an important role in swinging the sourcing deal Tata Coffee’s way. In April, a coffee sourcing deal was signed with Tata Coffee and Starbucks’ India adventure began. Schultz knew he had to get it right the first time around. The story of how they went about their India market entry is instructive. After travelling through India Schultz realised it would be best to sign on a local partner for the India market. On the face of it, the challenges were daunting: From the unavailability of prime real estate to getting a quality supply chain infrastructure in place. After he met Tata group supremo Ratan Tata and RK Krishna Kumar, vice chairman, Tata Global Beverages, in Mumbai, Schultz realised he needn’t look further. Once the JV with Tata Global Beverages was formed, work began in earnest. First off, Starbucks worked with Tata Coffee on making a new blend of espresso roast for the Indian market. This is crucial as there is a 100 percent import duty on coffee in India. All chains, except homegrown Café Coffee Day import their coffee. Starbucks, which had been sourcing coffee from India since 2005, knew that importing coffee would shave off a substantial part of their bottom line. A new roasting plant was set up and the whole process was completed in July, says Andrew Linnemann, director, Green Coffee Quality, Starbucks. 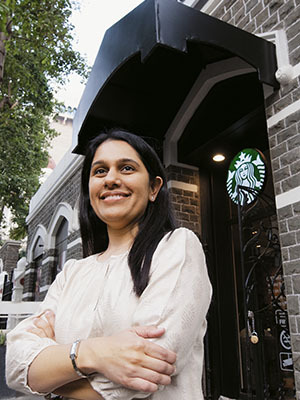 Confident of their quality, Avani Saglani Davda, chief executive, Tata Starbucks Coffee, says the company could even offer filter coffee when they open in Bangalore. Outlet staff were trained to make every variety of coffee the company offers. So maniacal is Schultz about outlets producing the perfect cup of coffee that in 2008, a month after he came back as CEO of Starbucks, he shut every outlet in USA for two hours while staff refreshed their coffee-making skills. In India, training counters were set up in Delhi and Mumbai. Starbucks works to get employees to ‘muscle memory’—the moment a drink is mentioned an employee knows exactly how to make it without mentally going through the steps. Store managers were sent to Singapore, Malaysia and Thailand for training on the shopfloor. Its pricing too is designed to be accessible to Indians. Its espresso is Rs 100, without compromising on the premium experience. Next came food. This is where coffee chains in India differ substantially from those in the US. In the US, customers usually don’t visit coffee chains for the food. As a result, food forms no more than 15 percent of revenue. In India the situation is different. “Here customers often come to the store with their families and have a full meal,” says Sushant Dash, senior director, marketing, at Tata Starbucks. In India, some coffee chains get as much as 35 percent of their revenues from food. When Café Coffee Day wanted to increase billing amounts per order from Rs 70 to Rs 80 per order, it did so by substantially improving its food. Starbucks knew it had to cater to Indian tastes while keeping food with a Western touch. Gary Martin, director of food, Asia Pacific, Starbucks, says it was about five years ago that the company realised food plays a much more important role in Asia. The company now sells green tea cheese cakes in Hong Kong and red bean cheese cakes in China. In India they worked for seven months creating an offering for the local palate. So there’s the mawa elaichi crossaint and the tandoori chicken sandwich priced between Rs 90 and Rs 150. In each city the company plans to have one local food item that is unique. One major challenge for Starbucks will be in replenishing its stores. Taj SATS, which handles the food, has so far had experience in serving Taj Hotels and the airline industry. Starbucks employees who spoke on the background of the company say SATS is still working on understanding the right mix to be supplied every day to stores. They say the Indianised offerings are more popular than the usual favourites like blueberry muffins. The last bit to tie up was real estate and this is where working with the Tatas helped. Initially, when their team went looking at properties, they thought real estate owners and mall owners would bend over backwards to have them. The initial enthusiasm gave them the confidence to ask for discounts on rent and free fit-outs, according to people familiar with their strategy. In the end, however, none of the hard bargaining seems to have worked. Starbucks has been forced to pay market rates of about Rs 200 to Rs 300 per sq ft and has also agreed to revenue sharing deals. In the end, it was Krishna Kumar, the man who led the joint venture negotiations, who had a brainwave. He knew that for a brand as iconic as Starbucks any ordinary launch location would do. In the last year, Horniman Circle, near Tata headquarters, had emerged as a veritable retail destination after luxury retailer Hermes launched a store there. Tata Sons had a 4,000 sq feet property there lying vacant. Krishna Kumar knew this would be the perfect location for the first store and worked on getting the Starbucks team on board. The store is marvelously well-designed. A joint team from Taj Hotels and the Starbucks’ global design team hunted for local craftsmen, who designed the furniture and fittings. With its high ceilings, ample seating, ethnic touch and free wifi, it gives visitors a sense of a ‘third place’—the place between office and home where people can come and spend time. So far the company’s outlets in Mumbai have been packed with the average waiting time stretching to over half-an-hour. They’re drawing customers from groups as diverse as students, housewives and young executives. On a recent afternoon, Punit Arora who works close to the Horniman Circle store ordered his seventh cup of cappuccino of the week. “I love this place. It is just like the coffee I have had at their stores abroad,” he said, while pointing out that once the initial excitement wears off he is not too sure how often he can come. It is something Starbucks will have to be conscious of, once it expands beyond the metros in the years to come. For now, customers in Mumbai can’t seem to have enough of what the Seattle-based king of coffee has on offer. It\'s quite fascinating how the roasting process has made the coffee taste exactly like in the U.S. The company has a way to go in terms of service training in India but it\'s off to a promising start.